I only use circular knitting needles. When I first taught myself to knit myself that's what I used and my preference has not changed. 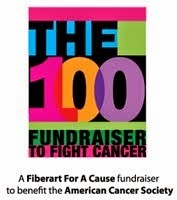 I began knitting with Addi Turbo needles. That is the brand that my LYS sold and I have always loved how slick and fast they are. I have sets of Addi clicks interchangeables in both lace and regular. Over time, I have discovered what I want in a knitting needle: metal, the pointiest tip possible, a fast knitting, slick, metal needle and a very flexible cable. In this comparison I have used several brands - I tried to illustrate the same size ,4, , but I only have a size 3 in Signature Needles so that's what I used. It's the only size 3 in the group. I am not fond of wooden needles so I don't have any wooden brands in this comparison other than the Clover bamboo needle that I have used as a tip comparison. I have not tried all brands of needles, obviously, so I can comment only on the ones I have tried. These are what I present here for a general comparison. Clover Bamboo: best quality Bamboo surface with a somewhat rounded tip. Many people love working with bamboo, but I am not one of them because I find that they are slow! ChiaGoo Knit Red Lace fixed needle. I really like the pointy tip. They're quick and comfortable and I like the red, coated cable on this brand. HiyaHiya interchangeable: I am a big fan of HiyaHiya needles. They're light, slick and pointy with a cable that is similar to Addi click sets. I think the HiyaHiya cable is a bit more flexible. Addi Turbo fixed: these needles will always hold a soft spot in my heart as I used them exclusively when I began to knit. They have a generally much more rounded tip. The tip works alright for me in the smaller sized, but becomes far too round when I use them for worsted weights. I really do prefer a sharp point. 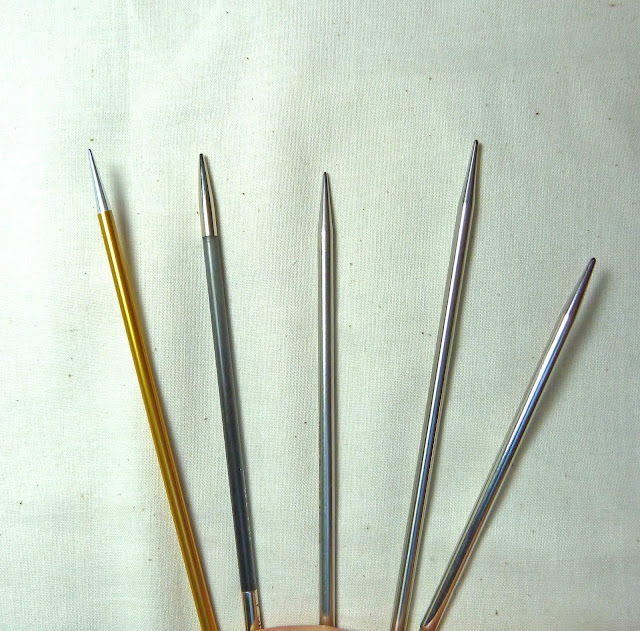 Addi Click Lace (Interchangeable): unlike the regular Addi Lace needles the click set is nickle coated rather than brass. I was surprised to see that when I got the set. I prefer the brass. When I inquired I was told that the nickle coating on the click set had something to do with the joins on the cables. I like Addi Lace needles. They are fast knitting and dependable. I'm not so fond of the Addi cable in general. It tens to be the most inflexible of the cables that I have tried. That holds true for all Addi needles that I have tried both fixed and interechangeable. Addi Click Interchangable Regular: pretty much the same as the Addi Turbo with generally rounded but still pointy enough tips in the smaller sizes. 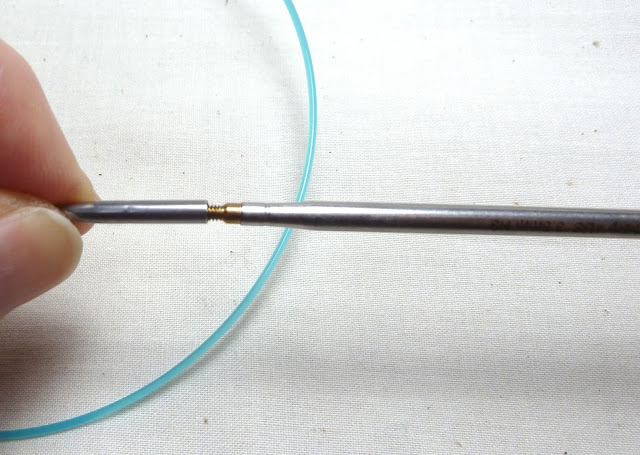 Addi Lace fixed: the same as Addi Clicks but with a fixed cable. Signature Needles: Size 3. This was a brand that I had wanted to try, but at $42.00 a pair they were not in my budget. DH kindly gifted me with sizes3 & 6 for the holidays. I love the cable on these needles! It is by far the most flexible of the bunch. The tips are, for me, the best - they are called Stiletto for a reason! 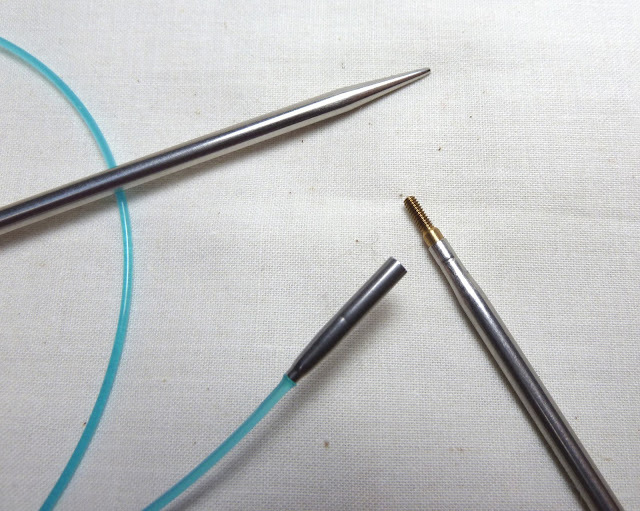 Signature also offers a "Middy" needle tip for those folks who are not fond of super pointy needles. The needles are smooth and lightweight. Lovely to work with. I found that there is a slight hesitation of the yarn as it passes over the 'colored' ares of the needle onto the uncolored tip. I wasn't sure how I would like that, but after using these for awhile I really do enjoy these needles and they are definitely on my short list of preferred needle brands now. The weight of the needles is an issue for me. I had carpal tunnel surgery in the past and was finding that I was experiencing the symptoms again when I was using Addi's exclusively. It was a non-issue really because I could put my wrist brace on and move along. That being said, when I began to use some other brands, such as Signature, HiyaHiya, GhiaGoo and Karbonz, I found that my wrist and hand fatigue were greatly lessened with the lighter weight of these brands. Above: the cable on the Signature brand needles is, hands down, the most flexible, soft cord on the market, IMHO. I simply love it. 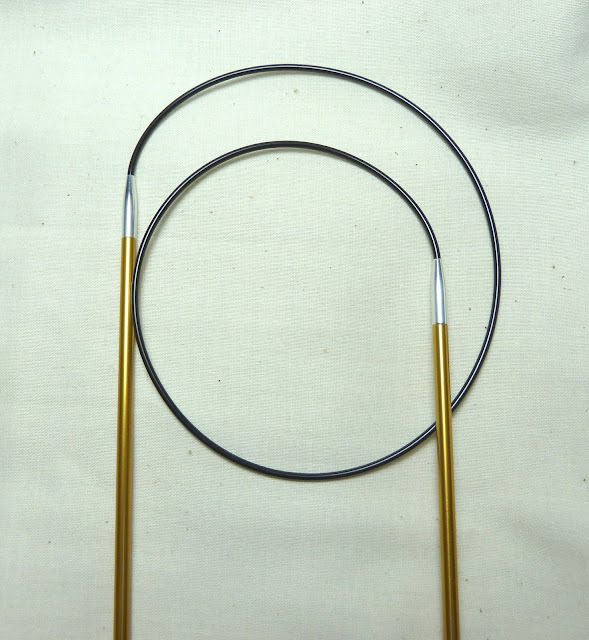 They are a pleasure to work with and afford a bit more range in that they are flexible enough that a 32" will often work (if that's what you have on hand) when a 24" needle is recommended for the pattern. Above: Signature brand on top and Kintter's Pride Karbonz on the bottom. The needle size imprint on the Signature brand is etched in the needled itself but does not change the smooth flow of the yarn over the needle. Knitter's Pride Karbonz imprint the size on the needle itself but it is also imprinted in black on the collar which you can just barely make out to the left of the white imprint. This is the cable on the ChiaGoo Knit Red Lace needle. It sort of looks like a very miniature version of the cable that is used on many bicycle locks! 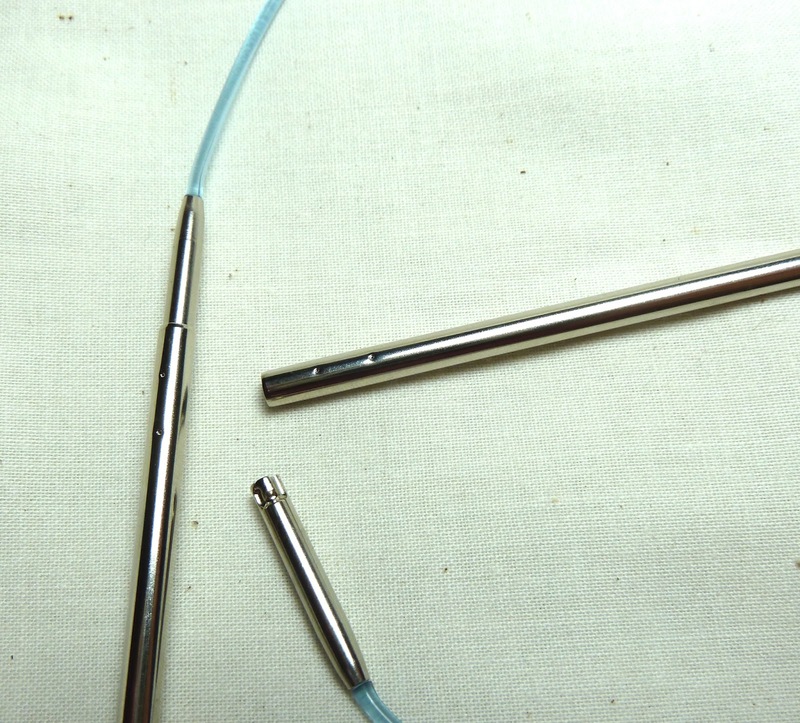 Above: The connection on the HiyaHiya brand interchangeable needles. It's a screw set - no chuck needed. I have found these to be very stable and I find almost no resistance as the yarn moves over the connection. It's a very smooth join. The cable on the HiyaHiya sets is similar to Addi's. A slightly deeper blue color and no where near as flexible as the Signatures or Karbonz but, there again, I really like this knitting needle set. They are very modestly priced in comparison to any of the other interchangeable brands that I have used. They are presented in a lovely fabric case, have super smooth joins on the cables and excellent, smooth, pointy tips. I think HiyaHiya is an excellent bang for the buck, and I really enjoy knitting with them. Signature Needle Arts come the closest to being my perfect needle. I love the flexible, soft, smooth cable, the stiletto tips and the light weight of them. They are so comfortable to knit with! I would prefer that they did not have the ever-so-slight hesitation over the needle, but I am told that this effect lessons as, the needles are used, and I can see how this might be true. Terribly expensive and rather cost prohibitive. 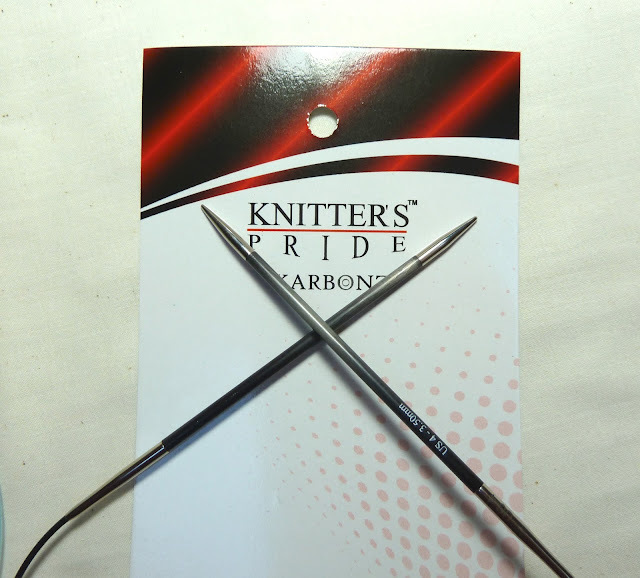 Knitter's Pride Karbonz: I like the light weight of them, the warm feeling in your hand, smooth tips and very flexible cable. Definitely 'doable' for my personal price point. They are a pleasure to use and I will be purchasing more I think. HiyaHiya: I am very fond of these modestly priced, fast, smooth needles with an effortless cable connection. The cable could be more flexible but it really it's not a deal breaker - it's good enough and I love the needles themselves. 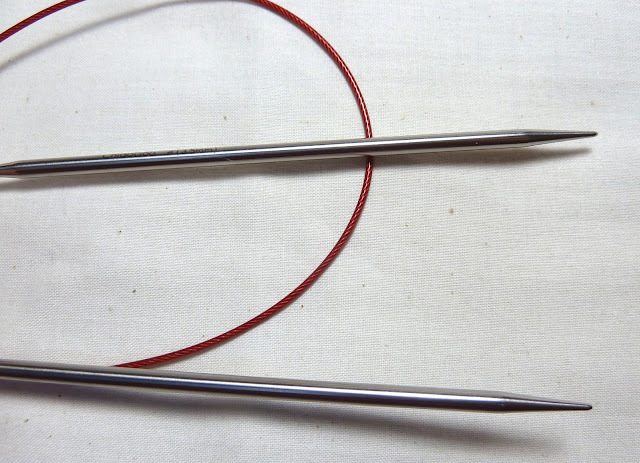 ChaiGoo Knit Red Lace: There is nothing not to like about these needles. On par with HiyaHiya as far as cost goes and quality. They are light weight, fast and pointy with good cables. I consider HiyaHiya and ChiaGoo to be quite comparable all in all. Addi Clicks, Addi Turbo, Addi Lace: How could I place these needles last on my list when they were my favorite for so many years?! Addi Lace fixed needles with the brass coloring. I will continue to enjoy using them. They are excellent quality and remain a favorite. Addi Turbos fixed: The tips are just too rounded for my current preference, although I still love the super fast needling. The cables, now that I have tried others, is not among my favorites. then would most likely move up to place 1 or 2 for me! The Bottom Line: when I can afford them, or when they are gifted to me, I will use Signatures as much as possible. After them I am currently rather enamored with Knitter's Pride Karbonz and beyond these two brands I remain happy to use either HiyaHiya or ChaiGoo brand. Of the two, if I had to choose only one, I would pick HiyaHiya, but they are both excellent choices; smooth knitting, lightweight with reasonable cables. And because I must enable your addiction (mine too), have you tried the Addi Sock Rocket needles? They are new. http://yarntreestudio.com/needles-notions/addisockrockets/ I have lost many a set of wooden needles to the dogs. They seem to feel they are chew toys. Just a caveat emptor, but my signatures (that I saved two months for) were a huge disappointment. Yes, the cable is flexible, but it bends sharply at the join and therefore breaks much more quickly than it does on my Addis, knitpicks, and ChiaGoos. The return period is WAY short, so this kind of wear breakage doesn't always pop up in the time frame. 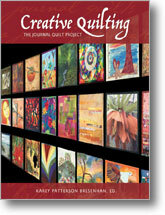 If you knit heavy projects like sweaters and afghans, this isn't a great option at all. Thank you for contacting us. I apologize for any confusion. 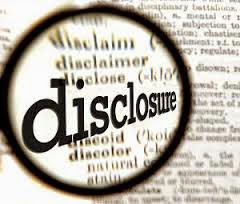 Our 21-day policy is for returns and exchanges of new products only. It is not a 21-day warranty. We offer a lifetime warranty on all our needles and cables. We will always replace a broken cable. When you refer to the Hiya Hiya Interchangeable set, are you referring to the sharp tip or regular? Thanks! I found this comparison VERY helpful. And I did get a starter set of Karbonz interchangeable in the smaller sizes. 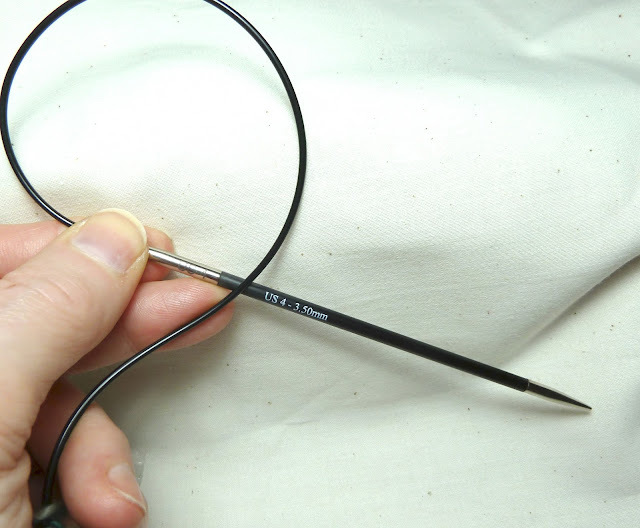 I absolutely love these tips and the needles but I have to say I find the Addi-click cables significantly more flexible than the Karbonz cables. Maybe they've changed? Anyhow, thank you for all this work you shared. 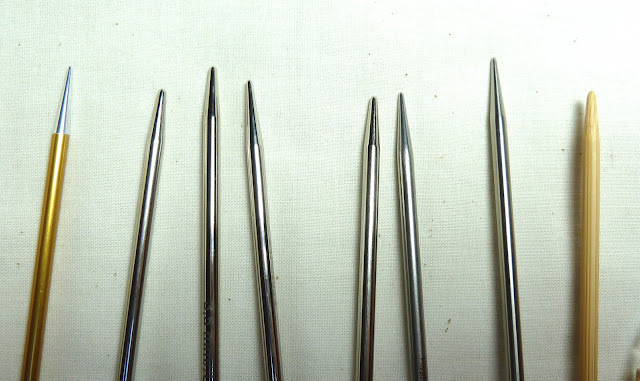 I have been a knitter for years but never realised there was such a variety of needles with such different results. I need really need signature but I think my husband would divorce me if I spent that much in needles. I am definitely going to try the others. Thank you so much for posting this comparison, it has been an education. Have you tried Knitter Pride “Zing”? I want to hear your comment on them comparing to others. I have the whole set of Signature but so sick of having to buy so many cables because they are not true “interchangeable”. (I have 32” for all 8 pairs but then I need 24 a few times for circular cowls, then a few 40” for three sweater projects on different sizes, then 47” for one of coat, 20” for the hats for two needles. 🙄 $20 for each cables 😤) Then I found Zing (I am in Europe. 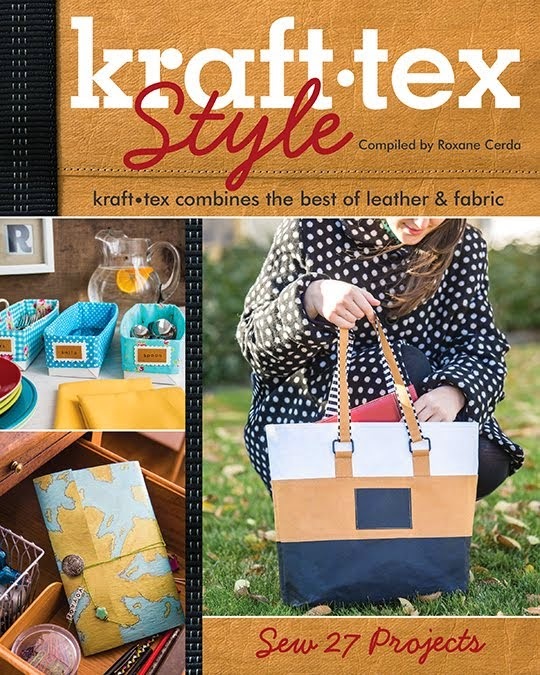 They use the name KnitPro). I like it a lot even though their tips are not as sharp as the Signature but they give smoother flow from tips to body, no hesitation at all. And the cords are truly interchangeable. On top of that, I can connect and disconnect as I knit the whole cardigan on 3 connected cords. I can disconnect soon as I start reducing for the arm hole, put the caps on the pieces I left then connect the needles back when I’m done with the other piece. 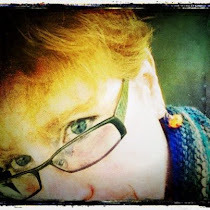 The annoying thing about Knit Pro or Knitter’s Pride is the customer service. My pair of 5mm came with uneven sharpness, one is blunt another is sharper. I told the customer service and ask for a replacement for just one so they match. Twice contact, never once respond!